Outfit your store with a stylish glass showcase. 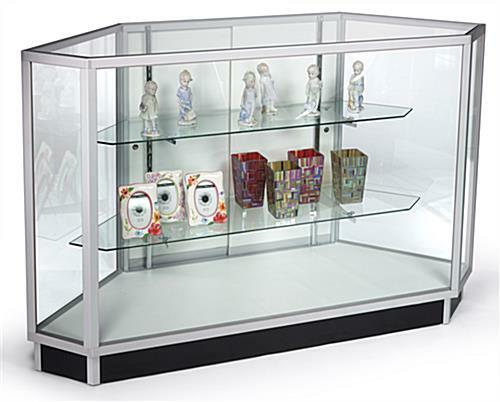 This glass showcase is perfect for use in cash wraps, retail store displays, and other display fixture configurations. As a part of our economy retail counters, this glass showcase, also called a corner display case, is designed to turn corners in a retail display fixture. Use it in combination with other retail counters to make the retail display fixture that best suits your display needs. Store display counters, like this glass showcase, allow you to create a number of display fixture configurations. 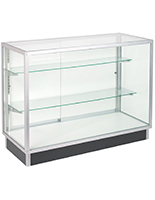 Get your products out there and increase sales with glass display cases. 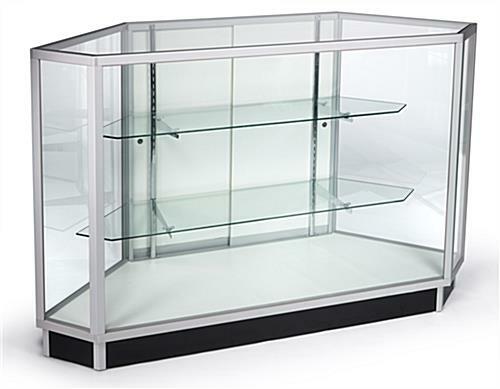 This glass showcase is ideal for showcasing popular items, on-sale merchandise, and even new products. This glass showcase and other retail counters are essential elements in a retail environment. Not only do they provide an area for displaying products, but they are also instrumental for controlling the flow of customers through your store. 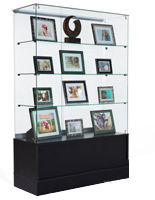 A glass showcase entices customers to stop and browse your on-display items. With a corner display counter like this glass showcase, you're sure to draw attention to your products. The glass showcase is built with quality aluminum extrusion. Each piece of glass in this glass display case is tempered; a process that makes the glass several times stronger than regular glass. It also makes it safer, because when broken, it yields small, more manageable pieces. Standard plate glass (annealed) remains in large pieces when broken and is a danger to you and your customers. The store counter, a store fixture, has two tempered glass shelves and adjustable shelf supports. 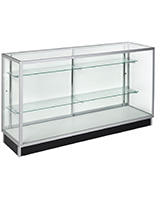 These glass display cases and other retail counters in this category ship pre-assembled to save you hours of assembly time. 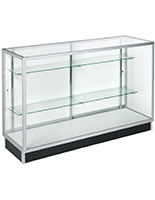 We provide this glass showcase with two adjustable, tempered glass shelves as well. With adjustable shelves, there is plenty of room for larger products. However, you can also showcase small items such as eyewear and jewelry quite nicely. Adjust the two shelves with ease to the heights that will accommodate your products. 59.3" x 38.0" x 17.5"